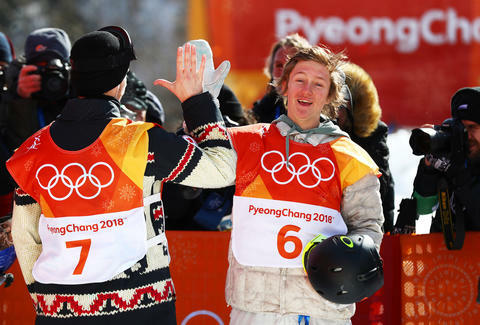 Red Gerard, literal Olympian, great American, and newly anointed patron saint of teenagers, won the United States its first gold medal at the 2018 PyeongChang Winter Games on Sunday and promptly said "holy f*ck" in front of the entire world. He's a 17-year-old snowboarder from Colorado who won gold in the men's snowboard slopestyle event. This is the second time in a row that the US's first gold of the Winter Olympics has come from snowboard slopestyle, but Gerard took his own path to that medal. His roommate, Olympian snowboarder Kyle Mack, had to wake him up after Gerard slept past the time he'd intended to rise on a day he's presumably been prepping for for his entire brief life. Relatedly, he'd fallen asleep to Netflix the night before. Once awake, he discovered that he couldn't find his jacket and had to borrow his roommate's. To his credit, he made it to the event on time. Though he was in last place going into his third run, that final performance earned him a place at the top of the podium for his creative approach to the course. But the excitement didn't end there. As the euphoria of the win settled in, Gerard let out a glorious "holy f*ck" and the network wasn't able to censor him in time -- even though the event was on tape delay. While he's got some competition from the preternaturally charming and hilarious figure skater Adam Rippon, Gerard is now in the running for most beloved Olympian. Once the broadcast cut back to the studio, NBC host Mike Tirico soberly said: "Apologies for the language. You understand the enthusiasm involved here." When the histories are written, this will surely go down as one of the best moments of the Olympics. In an interview on CBS This Morning on Friday, Gerard talked about his gold medal win, his “mess” of a morning before the competition, and his love for Chipotle. James Chrisman is a News Writer at Thrillist who believes making snow angels should be the marquee event of the Winter Games. Send news tips to news@thrillist.com and follow him on Twitter @james_chrisman2.